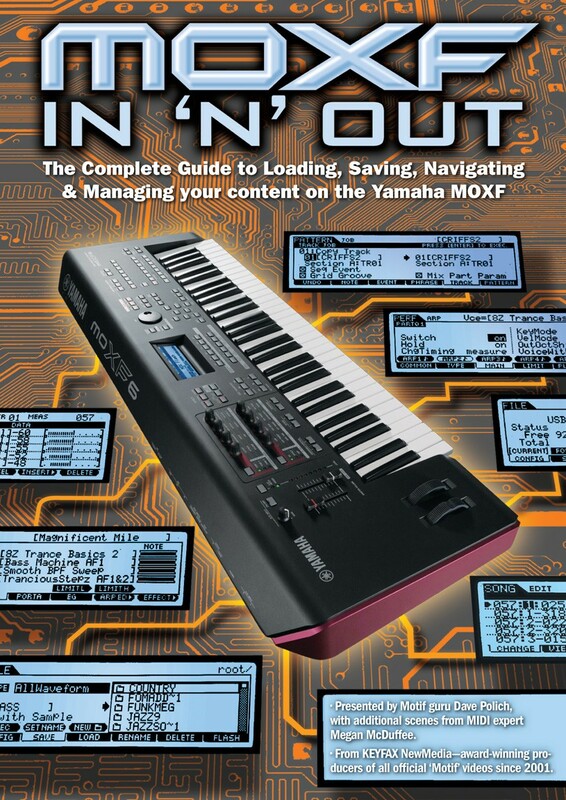 The Complete Guide to Loading, Saving, Navigating & Managing your content on the Yamaha MOXF. The essential – if in fact, only – video that gives you the low-down on Yamaha’s innovative MOXF. The MOXF is a mix of the flagship Motif XF and ‘Motif-on-a-budget’ MOX keyboard workstations. What the "F" is all about is "Flash" memory, a format that lets you burn new sample data onto an optional non-volatile memory card for permanent data storage and recall. This option opens the door to huge amounts of data storage and management thereof and MOXF In & Out is focused on all the many the opportunities afforded by this new facility. This video has two presenters: Dave Polich, and Megan McDuffee. Dave Polich is the Motif guru, who Yamaha has relied on to both provide new sample ROM for the series’ sonic engine room and also to ‘voice’ every single model in the range with a stunning array of Voices and Performances. Dave Polich is also the man who created the two most successful independent libraries sold exclusively here on Motifator.com: B’s Knees and Vintage Keys, along with some twenty other titles. In Part 2, successful young composer and MIDI expert Megan McDuffee examines the twists and turns of loading and saving new Pattern libraries, Arpeggios, and Standard MIDI Files. An explanation of the MOXF Modes and associated terminology along with a basic guide to Navigation. Navigating the internal banks and sound categories. Explanation of Voices: structure and relationship with sample waves. From individual voices to All files. The ins and outs, the whys and wheres. Loading Motif XF sample libraries; understanding the relationship between user and preset waveforms. Formatting, deleting waves and more. How to load data from several collections and create your own custom banks/libraries. The importance of the screen checkboxes and what to do when you didn’t! Ways you can load Patterns & Songs and what you can with them once loaded. Instant Guide to using Twiddly.Bits collections on the MOXF, including efficient navigation techniques. Guide to loading and managing General MIDI files and SMFs. Loading new arpeggio libraries and applying them to a Voice, a Performance, and within a Song or Pattern. If you are new to the ‘Motif/MO’ instruments we recommend you also view our video the Complete Guide To The MOX available here. Newcomers may also wish to take advantage of the MOXF/MOX video/DVD ‘bundle’.